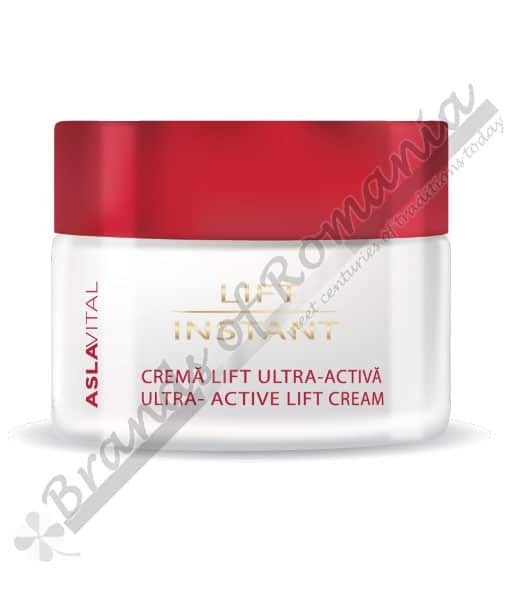 Ultra active cream – 50 ml. A cream that immediately tightens and firms. The products target all skin types, including the sensitive ones.Farmec inovation: The first line of products with the Gatuline Clay complex, a unique natural anti-wrinkle, with instant lift effect. The extract of Gatuline Expression, associated with Clay gives the cream unique anti-wrinkle characteristics. By quickly blocking the spontaneous contractions of the face muscles, the cream has an instantaneous decrispant effect and the wrinkle reduction is visible after only one application day. The skin microrelief is improved after only 10 days of using the cream. The ferulic acid, associated with vitamins A and E reduces the fine lines, wrinkles, pigmentation spots, increases the elasticity, stimulates the production of elastin and collagen, prevents the destructive action of the UV radiations. The vegetal phyto-hormones replenishes the deficiencies of mature skin and stimulate the cells regenerating process. The Boswellia Serrata extract, together with Clay contributes to soothing the epidermis, to activating the circulation and it fights against dark circles and pouches. The association of the complex of natural oils (sheea butter, soy oil, squalane) with clay, vitamins and natural active principles contributes to a good moisturizing and hydration of the skin, to provide a pleasant silky sensation. Apply twice a day, in the morning and evening, on face, neck and décolletage, after correct cleansing, massaging gently with circular movements, until complete absorption.